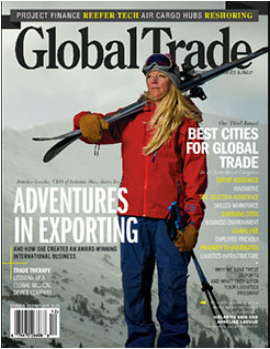 I recently shot good friend Annelise Loevlie for the cover of Global Trade Magazine as well as a few portraits in the story (on shelves in Barnes and Noble now). It was a good quick shoot assisted by another good friend Dag Larson. The creative brief for the shoot was pretty straightforward and we had a super limited window to shoot. We got the job done with a Profoto 600 Acute an umbrella used as a beauty dish and a little bit of filtered sunlight through the clouds of an incoming storm. I was on my way to The Meeting in Aspen and we did a quick rendezvous at the top of Loveland Pass. Anne is an amazing human and someone I’ve always enjoyed working with and just generally being around. She always has an interesting and thoughtful perspective on the world and I always feel spiritually refreshed when we get the opportunity to spend real time together. She’s also one of very few female CEOs in the snow sports world, on a million different development boards, a fellow writer for Powder Magazine, and too many other accolades to list. Here is a shot from another shoot with Anne to go with an article I wrote for Powder Magazine in 2012.